It often happens that a piece may protect two or more objectives at the same time. When this happens we refer to that piece as being overloaded. Usually, when your opponent has an overloaded piece you can use it in your favor by performing powerful attacks on his position (more exactly on the overloaded piece). Here is a common mistake found throughout many beginners game. White moved Rc3-c6 ?? and the position below resulted. This was a very bad move because the rook from c1 has been overloaded (it now protects both the rook from c6 and the checkmate on the back rank Re8-e1). That is why Black wins the rook 1...Rf6:c6 and of course, with that, he wins the game! Look at the example below. 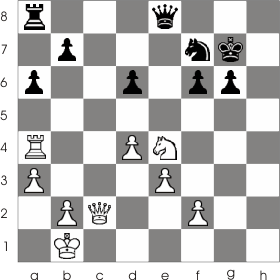 The black queen from c3 is protecting both the possible checkmate Q:e7 and the black rook from c6. With Rc1! 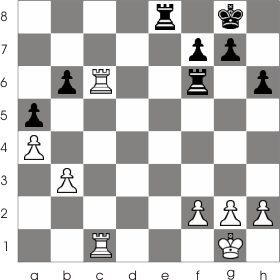 White performs both an attack on the black queen and an x-ray attack on the black rook from c6. Black will have to give up his rook in order to protect the g7 square. Look at the example below. 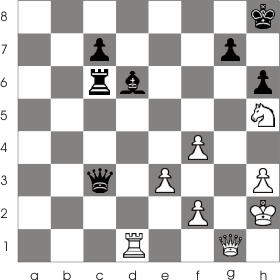 You can see that the white queen protects the white rook from a4 and the knight from e4. Black tries to take advantage of this by attacking the queen 1... Ra8-c8 but White can easily defend with 2. Ne4-c3. With this White stopped the rook's range of action and got the knight from the exposed square e4. This proves that attacking an overloaded piece (and generally using any other tactical procedure) won't always bring you the advantage if your opponent has enough resources to protect himself. This was an example of how you can protect your position against certain attacks of this kind.